Let me know where I can send it"
Since Onion Crunch is a hot, new hot dog condiment, Nick wanted the expert opinion of the Hotdogman. Those who know me well know "if it's free, it's for me," so I sent Nick my address and in a few days I got this honkin 12 ounce container in the mail. Nick grew up in Scandinavia- his dad was the US Ambassador to Denmark under President Reagan. While he lived there, he got addicted to a roasted onion topping the Danes put on their hot dogs. While visiting Denmark as an adult, he brought some home and his friends loved them. Long story short, Nick figured out a way to make his Onion Crunch in the USA and a new company and hot dog topping were born. I did a bit of research on Nick. The lucky dog is the longtime boyfriend of Sofia Vergara from the ABC TV show Modern Family. He is also a former candidate for Florida's state senate (I won't hold that against him) and is a Managing Partner at Carbon Solutions America. Not exactly the resume for a hot dog condiment tycoon, but what the heck. 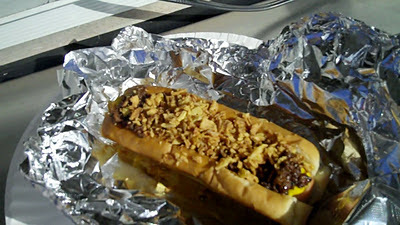 I decided to take my container of Onion Crunch down the road to Zipity Do Dog in Framingham. I thought Onion Crunch would taste good on a Coney Island dog and Mike down at Zipity's has the best Coney Island Sauce in the area. I turns out Mike had some Onion Crunch too! He loaded up a Coney Island Dog for me, replacing the standard chopped onions with Onion Crunch. He was thinking of creating a specialty dog highlighting Onion Crunch as the central ingredient, but for now he's just using it as an additional condiment. Onion Crunch tastes just like you'd expect. It has a nice onion flavor, but it's crispy and crunchy. I called it "Crunyumchy." It is similar to the canned fried onions you may be familiar with, but it is a bit crunchier and not at all greasy like other brands I have encountered. According to Nick, Onion Crunch is catching on as a hot dog condiment nationwide. 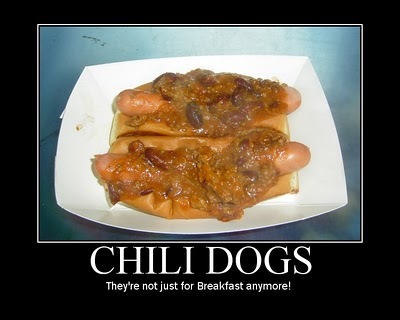 I can see why- it has a nice, almost smoky onion taste and the crunch adds nice texture to your hot dog; anyone who has ever put potato chips in a sandwich will love that. It's not bad as a little snack either. 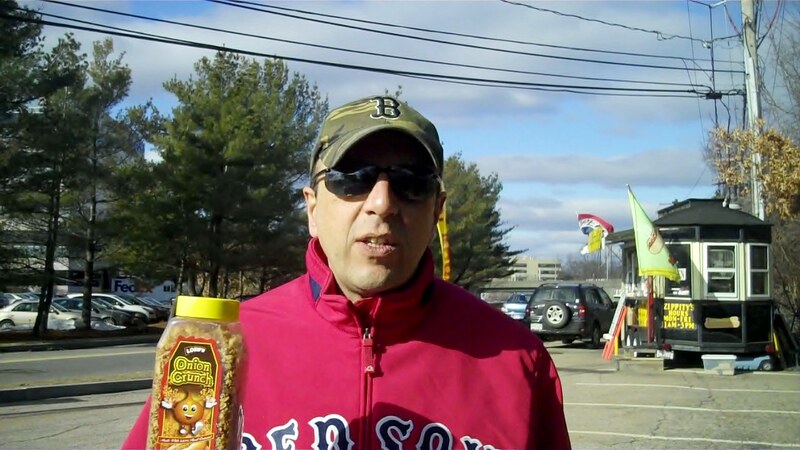 Onion Crunch is available in Massachusetts at Price Chopper, Big Y and Costco. I imagine it will be available at other stores soon too. You can also buy Onion Crunch online in the 12 and 6 ounce size or by the case. It's only $5.79 for the 12 ounce size- about the same for a big old jug-o-mustard- and it really is great on a hot dog! on a dog with Onion Crunch on it. What a woman! Just in time for the Spring doggin' season in the Northeast, Onion Crunch will come in some additional flavors: chipotle, Parmesan, bacon-flavored and barbecue. Bring it on, Nick. 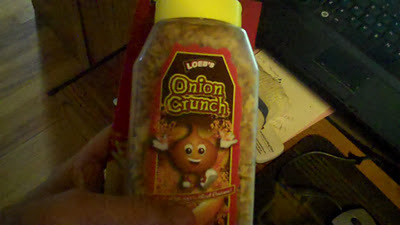 Onion Crunch is Crunyumchy! Check out the video of my visit to Zipity Do Dog with my container of Onion Crunch.